On Thursday, ITV, whose one-on-one format was favoured by Labour, announced it too was abandoning plans for the programme. 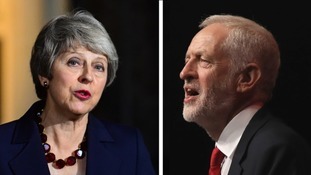 A spokesperson for the channel said: “ITV invited the Prime Minister and leader of the Opposition to appear in an ITV programme this Sunday evening, and we have been clear that it is up to those invited to decide whether they want to accept the invitation. Labour accused the Prime Minister of "running scared of debating Jeremy Corbyn, just as she did in the General Election". A spokesperson for the party continued: "Jeremy Corbyn accepted the Prime Minister's offer of a debate on Brexit immediately. "He said he would relish the opportunity to debate her, and that remains the case. "Labour believed the head-to-head offer from ITV was the most straightforward format. "The Prime Minister has refused to join Jeremy in a head-to-head debate. Her team tried to confuse people with a convoluted format, but the British public will see this for what it is - Theresa May unable to face real scrutiny over her crumbling deal."